I am going to give some lessons today. All of these are lessons that I learned the hard way. These lessons focus on how in the world you get your children (and your spouse) to drink a smoothie that is packed with greens and other hidden and amazingly nutritious gems. It is possible. I promise. Just do not do what I did. There truly is no better way to give your children almost a full day’s worth of their fruit and vegetable intake than in one single glass. In fact, nothing makes me more excited. There are many nights that I do not fret that the vegetables on their dinner plates do not get finished. After all, only I am keen to what their smoothies were jammed with only hours before. But…I made many mistakes along the way with my first son (and my sweet spouse). These mistakes forced me to put my smoothie making on a brief hiatus. I had to re-group. I needed to come up with a new game plan. I learned some tricks with my second kiddo, however. And now? My little three year old can down a smoothie within seconds. I actually caught him pouring the rest of his big brother’s leftovers into his own cup yesterday when his back was turned. I pretended I did not see it, though. Really. It was not like he was stealing candy. I previously did an entire post about one of my favorite smoothie secret ingredients: Kefir. Kefir is so abundantly good for you that I got a bit over-zealous with my additions to my smoothies. And plain Kefir (especially home-made kefir made from raw goat’s milk) can be VERY tart. Oh, so very tart. And that, my friends, is where I went a little wrong. It actually turned my husband off of smoothies with kefir in them for well over a year. My son – a much easier convert – came back to the “green” side within a few months. Considering I can chug plain kefir straight, I have a feeling my biased taste buds were not telling me the true story of what a mid-thirty year old and his half-way picky son would actually think of the concoctions whirring away in my blender. So..these lessons will be short and sweet. They are so simple, I actually wonder how I did not know these to begin with. 5 Lessons on How NOT to Turn Your Kids (and Husband) Off of Smoothies. LESSON 1: When they ask what makes the smoothie green, tell them it is kiwi turning it that lovely shade of murky swamp. Do not mention the avocado, or the kale, or the spinach, or the mustard greens. Omission is not the same thing as lying. Right? This actually brings me to another lesson. No. Not about lying. LESSON 2: Always add frozen blueberries or cherries. A lot of them. You may have more stains to clean (on clothes, the carpet, etc), but your smoothies will no longer be green. I am not sure that there is really a named color on the spectrum for what color it turns them, but I would never call it any shade of green. LESSON 3: Do not get carried away with the ingredient that you think to be the most healthy. Use the low and slow method. The taste will be in there in the beginning, even if very subtle. You can slowly add more as they get used to the flavors over time. This is where I went wrong with the Kefir. I went big from the start. More is not always better. Not when it comes to picky husbands or cautious children. LESSON 4: Do not serve your children a smoothie every single day for a solid month. It will lose it’s novelty. Anything done too often really will lose it’s charm, no matter how much you love something. Even if they love your smoothies on Day 1, on Day 12 they will be bored. On Day 30, they will be repulsed. I tried this experiment with Chocolate Chip Ice Cream not too long ago. Chocolate Chip Ice Cream is our favorite dessert. So, I let my children have a small bowl of it every evening after dinner for what I intended to be thirty days. On Day 1, they jumped for joy. On Day 12, my oldest asked for a different dessert. My youngest left his bowl untouched until it was a soupy mess. On Day 20, I told them that this was the only dessert left in the entire house. On Day 21, they both asked for an apple for dessert. I ended the experiment early. It does not work. Instead? Try this. “Wow! 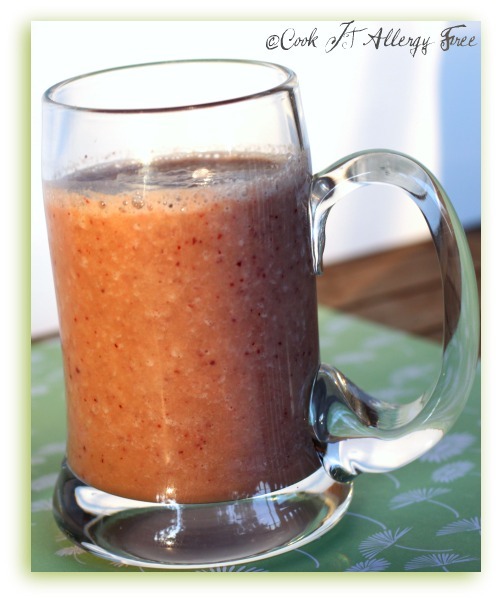 This smoothie is so good I think I am going to keep it all for myself.” Then pour a big frosty glass of it. Leave it on the counter and walk away without referring to it again. Place their favorite snack next to it. Place a really cool straw like the one below in the big smoothie glass. 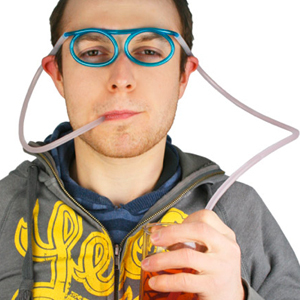 We have those sunglasses straws. The kids will drink anything through them. Oh…my husband will too. Note. That is not my child. This picture is off of Stupid.com. Don’t judge. It is the only place I could find a picture of this crazy straw. I tell you these lessons with a bit of tongue and cheek, but the underlying element behind each of these is totally true. I mean it. Omit, but do not lie. Embrace purple stains (a small sacrifice for health). Remember that less is best (at least to start). Take breaks. Pretend you do not care. Get these Straws. And now…I will give you the recipe for the base of one of our favorite concoctions here. This one is a great starter. It is packed with so much goodness, yet the kids will enjoy it. Over time, I have managed to increase the greens to triple the amount below and have replaced the water with more kefir by using the low and slow method with my boys. I also tend to get creative with leftover vegetables in the refrigerator (as I mention below). However, I follow my rules in order to keep this momentum going. 1. Throw in the bananas, berries/fruit choices, cherries and/or blueberries, greens, kefir, apple cider, water, ground chia, flax, or hemp seeds, and raw honey or vanilla stevia. If you are not using any frozen fruit, you should probably add some crushed ice to make it nice, cold, and refreshing! 2. Blend all together for about a minute, or until really creamy and smooth! You can add more liquid (kefir, organic juice, or water) to whatever your desired consistency is. Smoothies are so forgiving, so you can really play around to make your own “magical concoctions”. I will often throw a few veggies in from the previous night’s dinner as well. I have added beets, pumpkin, squash, carrots, daikon root, parsnips, avocados (not a vegetable, I know)…you name it. It is a great way to use up leftover vegetables. Be warned though, some experiments work better than others in these kitchen trials. NOW HIT ME WITH YOUR FAVORITE LESSON TO GET YOUR PICKY EATERS TO DRINK SMOOTHIES! This post is linked to Real Food Weekly over at The WHOLE Gang. Ha, I’m not a kid anymore but I still perked up when I read “kid friendly”. 😉 It does look good, Kim! I would drink it, even if there was someone blowing it out of proportion with too much excitement. Regarding that, in my experience, less talking is sometimes better than being overly vocal – as you suggested, as well as omitting to mention any “weird” or funny ingredients. For example, I didn’t mention the avocado in that chocolate frosting I blogged about and I don’t think anyone knows about it still, with the exception of my grandmother and my brother, who were both clearly fascinated and amazed when they tasted it. I haven’t done any smoothies this month, but maybe I will. An aside, have you checked out Odwalla’s fruit juice smoothies? They also have a green one that includes wheatgrass among other greens and everyone in my family likes it and drinks it, among their other juices we’ve tried. There’s also Happy Planet but I’m not sure if their fruit juice smoothies are sold in the States. Zoe, I am the queen of not letting people know what the actual ingredients are in something! And I love using avocado in chocolate pudding or frosting! I have seen the Odwalla juices, but I have not seen the Happy Planet ones, I don’t think! Interesting. I’ll try it out and report back to you. Sounds delicious. Awesome recipe, I’ll have to try it out. The apple cider sounds like a great idea for adding to smoothies. Something different to spice it up. I love green smoothies and it is so easy to hide the taste. You’ve got to try freezing some smoothie mixture in ice block molds – what kid won’t eat ice cream? Ha they just don’t have to know that its got all those healthy greens in it! You want to make the mixture a bit thicker to freeze though, and make sure there’s enough fruits in it so its sweet. Eva, I love that idea of freezing the leftover smoothies in ice trays. That is even a good idea to use them when you are making the next smoothie. Throwing a few of them in with the next one instead of ice would work awesome. Hmmm…now I will have to try that! I didn’t even think of adding raw honey, that is a great idea and I will be doing that once honey is allowed back in our diet. I also think I will add some chia or hemp tomorrow, I’ve been sticking with the plain formula of water, fruit and greens but I think we’re ready to bump it up a notch. Kale, spinach and chard seem to be the mildest of the greens and I can get away with adding a lot of them. I went a little overboard on the collards yesterday and had to drink the whole pitcher myself (but geez, I’ve gone down a whole dress size in the two weeks we’ve been drinking them, so bring it on!). Another thing I’ve been adding lately are micro greens/sprouts, I even found some micro amaranth the other day at my co-op (aren’t they supposed to be super nutritious?). Might need to get a sprouting tray. I can just imagine you in your onion goggles. LOL And yes, those sunglass straws are hysterical. And btw, I LOVE microgreens. I also add those to smoothies all of the time too. But I also use them on the kids sandwiches and as our salads all of the time! I have a sprouting tray that I am SO lazy about using. I suppose I should get back into that! Great post, thank you for the tips! Hi Caneel! Thanks so much! p.s. – Heidi – congrats on going down a dress size. That is amazing!!!! Nicola, this has been such a wonderful event! I cannot tell you how many fun new ideas i have gotten for smoothies! I think Heidi’s idea of sauerkraut though is the most unusual and unique! 😉 I still have to try that one! O hope you found some kefir! I think you will love the health benefits! Thank you for including me in this! I am so totally enjoying it, my friend! Great post Kim! Your tips are perfect – I’m working hard to get my oldest to drink a darn smoothie. He watches me like a hawk and won’t let me put greens in! Argh. I’ll get there, slow but sure. His younger sister happily drinks his leftovers! I would love to get my hands on some coconut milk kefir. I can’t get coconut milk yogurt yet, should I just make my own? Thanks Maggie! Keep trying with the smoothies. I have definitely found that my boys drink a lot more if they do not actually “see” what goes in it. Maybe you can trick him to turn away for a second. LOL And you could totally try making your own coconut kefir with some starter grains. We can get coconut kefir at our Whole Food’s so I have not tried to make my own coconut version yet. So I ordered similar glasses on Amazon that are clear, not neon. I have free shipping so I got 4 pairs for about $17.50. Now that those are on their way and I am preparing to use your awesome tips, I am slightly concerned about the glasses… How do you keep them very well cleaned????? Do they clean easily with hot water or do they have to be soaked with each use? I so love them and if they get my kiddos consuming green smoothies, will be so worth it! Thanks! Oh, what a delightful post, Kim! Love how you’ve shared every one of your smoothie secrets in re: to kids and hubbies! 🙂 And, of course, I laughed out loud when I saw there was apple cider in this recipe. You should rename your blog to Cook It (or Make It) with Apple Cider! LOL Love the raw honey addition, of course. I’m still a kefir virgin. Guess I’ll be trying the coconut kefir. Do you ever use that? I almost bought evaporated goat’s milk to recreate mom’s fudge yesterday, but decided I’d wait. Need to look at the ingredients first, too. Anyway, all that to say that I’d gladly take one of these smoothies. And before I forget, I love how your little one stole his brother’s smoothie!! Shirley, you know what is funny? As I typed the Apple Cider into the recipe, I actually thought to myself that you might call me out on it. I think I must have some weird attachment to AC from my youth. LOL I love the flavor it adds to things. That might be a good idea – change my name to Make it with Apple Cider (it could be my code name). And I have bought the coconut kefir before. It definitely has a different flavor than the goat’s milk or cow’s milk kefir, but it is still really good. Hi Lovie, can’t wait to see the picture of the kids wearing the glasses while drinking the smoothie. Love your list of ingredients. Michael and I are religious about our smoothies and never get tired of them. Now I will try to add some green stuff as well. We also use a scoop of protein whey which makes it creamy and curbs our hunger as well. You are the best Mommy ever!! and I am so proud of you. Tia, I think that it is too funny that Max eats everything. The fact that your little guy LOVES spicy is what really gets me. I am working on that one with my boys. I keep making things just one notch spicier each time to see if i can build up their tolerance. I think Heidi’s idea of making your smoothies the night before is great. Then you will be all ready for his “Green smoovy” right when he wakes up! Great advice! I love the story about icecream too. Unfortunaely this is true of ‘good’ things too, my hubby fell in love with smoked salmon at first bite, then proceeded to eat it constantly. He now loathes it, and I can only eat it when I’m out. The glasses are a fantastic idea too, sometimes you just need to swtch things up a little. When my eldest was tiny she refused to eat soup, but she loooved hot tomato ‘milkshakes’ in a cup with a straw. Hi Intolerant Chef! That story about your husband and the smoked salmon is too funny! But I totally get it! I have had that happen to me on a few things as well. And what a great idea to call tomato soup a hot tomato “milkshake”. It seems I can get my kids to eat anything if I add the word milkshake onto the end of it. That was so fun to read, Kim. Your advice is so good, too. I wish I had done this when my kids were little. Luckily they were veggie eaters to begin with. Can’t wait to see the glasses. Thanks Wendy! I do not think you have anything to worry about with your two vegetable eating machines that you have! Your kids sound like they eat healthier than most people I know! You rock in what you are doing with them! 😉 Will post the glasses on the boys soon. Just have to get them to pose for a pic! Awesome post! How come that ice cream trick doesn’t work for me? I eat ice cream every night after dinner! LOL! Kim, I know. I still wanted the ice cream on Day 20 and 25 and 30! LOL Oh well. Maybe the smoothie counteracts the ice cream! 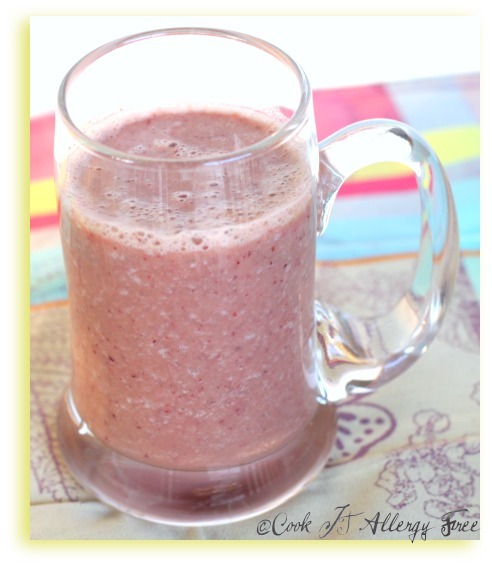 I love making easy yet tasty smoothies like this one! You can put anything in it that is good for you! Can’t wait to try your kid smoothie for myself. I love green smoothies and while I have some favorites I have never tried Kifer. As my grandson is not old enough to consume honey, I will try replacing with organic Agave. Thanks for the recipe. Hi Connie! You have to give the Kefir a try. It adds so many good benefits, including protein, probiotics, and good enzymes. And the agave will work great in these smoothies instead of the honey! You got me hooked with your Berry Smoothie! I probably make it at least two or three times a week! And now you’ve got me making my own Goat’s Milk Kefir. Yum!!! Tart and delicious and perfect for your smoothie! Aww..Ellen! You are so sweet! So impressed that you are now making your own Goat’s Milk Kefir! How cool is that? I love the tart taste of it (although I know not everyone does)! I am so very glad I stumbled onto your blog! Via “dishtowel diaries – gfm- to you!!! WOw! What great ideas for packing in extra good things! I have to say , the “lego” thing really hit home =) My little one loves smoothies, but is very careful because daddy knows I might put something “weird” in them!! LOL!! I am going to try the kefir in them as well, my little guy needs to bulk up, and I need to boost protein! I have never made a green smoothie, so I will give it a whirl! I wonder if I can add broccli? Thanks for the wealth of info. and for the great laugh!! I am a Senior in search of a budget wise simplified way of eating. Green and fruit smoothies are vital to good health. Would love more direction to where to access more recipes for limited income Seniors Vegan preferred! I’m just a “grown up kid” and why I visited this website for the first time. Assumed it would be easy recipes to implement for optimum health! I have a 3 yr old and a 6 yr old, they love to have a smoothie every day when they come home from school/preschool. My trick that got them to drink my green smoothies is that I called them ‘Shrek smoothies’! I figured strawberries, red, with spinach, green, makes brown, right? So in my recipe I only use yellow/orange fruits with the greens, like banana, pineapple, mango and peach with spinach. It makes the green really neon bright green, exactly like Shrek’s coloring. My 6 yr old even declares it tastes just like Shrek. Lol My 3 yr old usually drinks 2 glasses and walks around with her tummy all full and round. Now we play a game, where they guess what color the smoothie will be today, peach, orange, purple, green etc. Oh, forgot to mention,I always add a scoop of protein powder and sometimes Greek yogurt. Gives them a protein boost.